Fremont is a neighborhood with a little of everything that makes Seattle awesome, like outdoorsy pursuits, proximity to the water, foodie delights, unique shopping, interesting architecture, and a bit of quirk. It’s small enough to explore on foot, but has a lot packed into that small space. Also, it is tucked between major landmarks, like the Gas Works Park, Woodland Park Zoo, Green Lake, and the Ballard Locks, and it makes a fine pit stop before or after any of those. If you haven’t explored the “Center of the Universe” (at least according to the famous sign in the center of the neighborhood), then now is the time. Here’s what you shouldn’t miss while there. The Fremont Troll is one of the most famous landmarks in Seattle. Located under the Aurora Bridge (any self-respecting troll should be located under a bridge), the Fremont Troll is an 18-foot-tall sculpture of a troll grasping a full Volkswagen Beetle (which used to be a time capsule for Elvis memorabilia) in its hand. It’s a unique, ideal photo spot. The Fremont Troll is just one of several quirky landmarks in Fremont. Fremont Rocket (a 53-foot Cold War rocket fuselage mounted on top of a building on North 36th Street and Evanston Avenue North), a statue of Vladimir Lenin that was originally on display in Czechoslovakia (located at the same intersection as the rocket), and a signpost that marks the alleged center of the universe and tells you how far it is to many locations around the globe. That sign is located at North Fremont Avenue and North 35th Street. Theo Chocolate is a Seattle company worth a visit. The shop is all about fair trade organic chocolate in every variety under the rainbow. Join a tour and get up close and personal with the factory process. Like most places in Seattle, Fremont is a great area to enjoy local cuisine. Most restaurants are along North 36th Street, and include Revel (a Korean bistro), Jai Thai, Red Star Taco Bar, and others. Another great option includes PCC Community Market (similar to Whole Foods), where you can pick up lunch and bring it elsewhere to picnic. Fremont packs a lot into a small space regarding watering holes. You’ll find places to enjoy a microbrew, like Fremont Brewing (it’s both dog and kid friendly), George & Dragon Pub, or stop by Brouwer’s Cafe to enjoy Belgian cuisine and a beer. If beer is not your thing, Schilling Cider House offers up cider tastings. All year round on Sundays from 10 a.m. to 4 p.m., the Fremont Sunday Market fills the streets, at the corner of 3410 Evanston Avenue North, with crafts, food, vintage clothes, antiques and more. Patterned after European street markets, it’s a great way to spend a Sunday afternoon. Beyond the street market, Fremont is a different place to shop. You won’t find big box stores or oodles of shops, but a pleasant array of locally owned businesses. Check out the Fremont Vintage Mall; PCC Community Market for food items, beer and wine, and health items; or peruse Jive Time Records if you’re into vinyl. 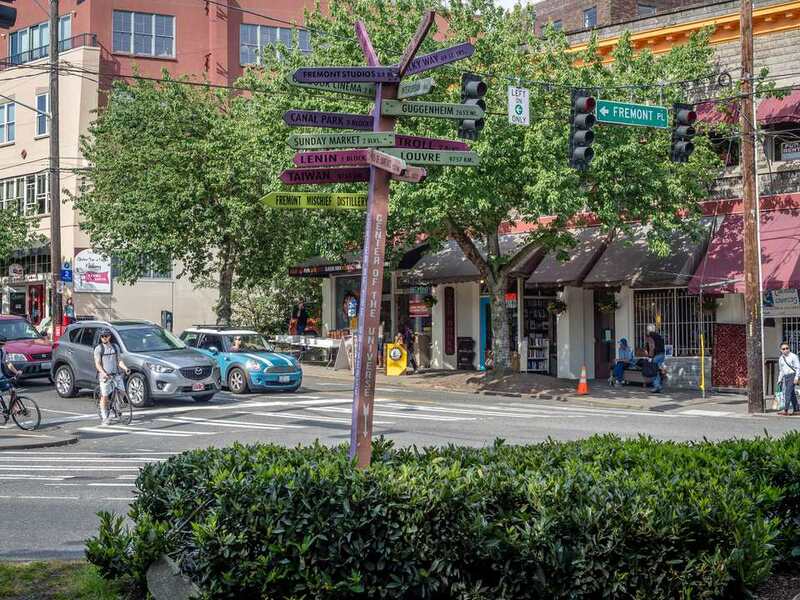 Fremont is a carefree, fun neighborhood, and its festivals are too, including Fremont Oktoberfest in the fall and the Fremont Solstice Parade (known for naked, body-painted bike riders) in June. New Tacoma - Where Is It and What Is There to Do?